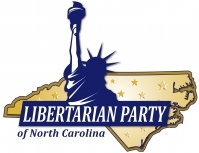 RALEIGH (April 14) – The Libertarian Party of North Carolina passed a resolution calling for the governor to pardon Todd Stimson, who was convicted of marijuana trafficking, at its annual state convention in Durham April 11-12. Libertarians believe all individuals have the right to exercise sole dominion over their own lives, and have the right to live in whatever manner they choose, as long as they do not forcibly interfere with the equal rights of others to live in whatever manner they choose. Copyright © 2015 Libertarian Party of North Carolina, All rights reserved.